THE YEAR IS ALMOST OVER! Well, let’s view it like THIS: We at www.mystilbaai.co.za found that is quite a challenge to communicate with the holiday makers regarding events and activities that take place during December (and January) in an around Stilbaai. There are only so many lamp posts that can be used for advertising and some space at SPAR and OK Grocer while many shops and stores are accommodating enough to make space in their windows for posters. Then there is a Holiday Guide (in the Blitsgids directory) while the Information Centre (Tourism) also have a printed program available. Holiday goers can also find information on ‘what-to-do-where-and-when’ in the local newspaper’s Holiday Guide which is also available online while the new Hessequa News (newspaper) has printed a guide with copies available at selected stores. Stilbaai Sakekamer’s updated program (we use this program in the ‘EVENTS’ section) is also available on their Facebook page while information is also available on the App (Southern Cape Hessequa) and various Facebook groups. Companies and organisers distribute flyers (when and where allowed) and leave brochures at businesses while businesses who actively ran Facebook pages or websites, use these avenues to advertise. So, information is available through various avenues. SHOPPING! Visit the Stilbaai Kersmark; Sleeping Beauty Traders or Southern Comfort next to the river where quality handmade goods and art are available. Or go ‘art shopping’ at the ‘pop-up’ art shops Artroom Art Studio and Art @ The Noisy Workshop while there is also an art exhibition at Tuin-op-die-Brak – and of course you have to spend time at this special ‘garden’. You can also shop at a variety of shops where you will find great gifts as well as other great stuff. You will be amazed! THINGS TO DO: Rent a canoe or any of the items at the bridge and have fun or book an adrenaline trip on Sea-vu-Play (boat) or go on a more serene trip on the Santamaria (tiki boat). You can also go fishing on a charter boat! HIKING: Did you know that there are five various hiking trails in Stilbaai? Why not try it? And you have to visit the information centre and museum where you can feed tame fresh-water eels and you can not leave Stilbaai without a visit to the Tuin-op-die-Brak! BRAAI, ACTION, GOLF AND SPORT! How about a ‘braai with a view’ next to the beach at Morris Point? Stop at the look-out point above the harbour or play at the BMX / skateboard park close to the Angling Club. You can also play Putt-Putt or golf (at the Stilbaai Golf Course or at Eden Park Golf close to Jongensfontein), tennis or bowls. And when on the beach, play volleyball or cricket and enjoy all the activities on the water (swimming, floating in the river, body-surf, surf, SUP, kite-surfing etc). And if you have not taken your mountain bike on the routes and roads in and around Stilbaai, you are missing out on some of the most scenic rides you can find! You can even arrange to tackle the 4×4 sand route at Eden Park or why not take the ‘river road’ and explore the countryside? GO VISIT: … the ancient fish traps at Skulpiesbaai and Chris Benade’s spectacular model train show at his house! And the harbour! We at www.mystilbaai.co.za try to make all the activities and events available at one place – here! Just visit the ‘EVENTS‘ or ‘ACTIVITIES‘ pages! TOMORROW (Tuesday, 29 Dec) – Be at Lappiesbaai beach as the first teams competing in the annual 5-day Trans Agulhas Challenge are expected to arrive just before 9:30. They leave again on Wednesday morning. You can also go to the Bewaringstrust’s Exhibition at the Jagersbosch Hall and attend their Wine Tasting at 19:00. Bobby van Jaarsveld will perform in the Community Centre in the evening while Dewald Dippenaar will be in action in at El Suenos Bistro. The program for the rest of the week is available under ‘Events‘. Well, this is just some of the things we can suggest you do at Stilbaai. 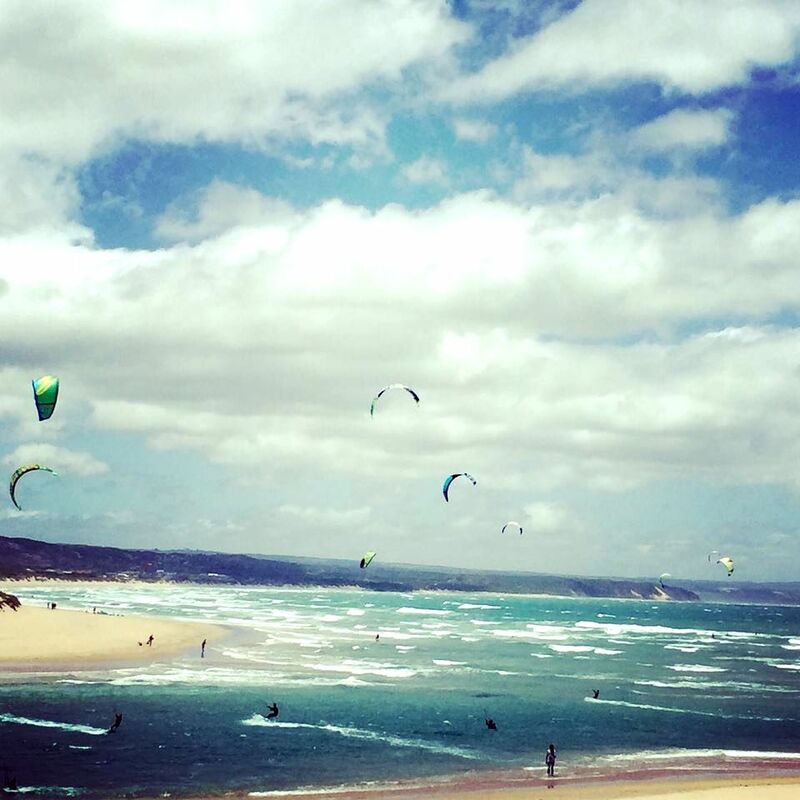 … and on a windy day, enjoy some kite-surfing, even if you just watch!